It is stag rutting season. Most of the animals watch as Trey fights with another stag. The hope is that Trey would lose… however he does not. As this goes on, Bully and his rats pay Fox a visit in his earth, telling him to take his Farthing Wood lot and clear off. 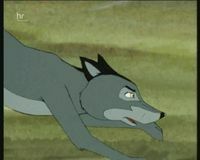 Just as it looks as if Bully’s rats will try to kill Fox, Hurkle turns up, forcing them to flee. Fox decides to launch an all out attack on the rat headquarters that night. Despite killing many rats, Fox realises it will never be enough. Meanwhile, at the housing estate formerly known as Farthing wood, as Owl sleeps on the Great Beech, she is awakened by the sound of another owl hooting. Very soon, Hollow, a male owl, turns up on the branch. Owl and Hollow soon become friends and hoot together. 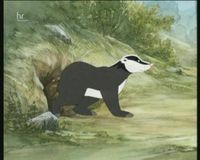 Bully is annoyed with Spike for not warning him of the animals attack, and warns him that he will in serious trouble, if he is attacked again without warning. 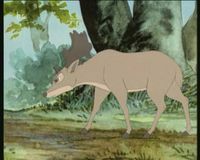 Whistler, meanwhile, flies some of the smaller animals back to White Deer Park, where Dash tells him all about the battle. 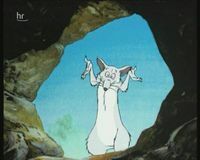 The Weasels have set up home by a river, where Rollo continues to bring food. As he, Weasel and Measly sleep, however, Fido and Cleo take the food bowl onto the river as a boat. Before long they are heading for a waterfall. Rollo hears their cries for help but ends up falling in the river when he tries to save them. Measly is about to grab the twins when the wild cat suddenly reappears. Fido and Cleo manage to escape from the river with the help of some terrapins. Rollo has gone over the waterfall, and is feared dead by the Weasels. Cleo and Fido are extremely upset. Little do they know that Rollo’s owner, the farmer, has pulled him out of the river, half-drowned but still very much alive.